Canada, the EU-28, and the United States have put forward greenhouse gas reduction targets in their intended nationally determined contributions (INDCs) to the United Nations Framework Convention on Climate Change, and Japan has published a draft of its proposed target. Each country uses a different base year from which to measure its reductions: the EU-28 uses 1990, Canada and the United States use 2005, and Japan uses 2013. This chart presents each target against each chosen base year to help facilitate easy comparisons. This chart uses historical greenhouse gas (GHG) emissions data and the targets and timetables in submitted intended nationally-determined contributions (INDCs) for Canada, the EU-28 and United States, and a proposed INDC for Japanto estimate emissions in the year 2030 for each country. The Canada INDC target is taken as a 30% reduction in GHG emissions by 2030 from 2005 levels. The EU-28 INDC target is taken as a 40% reduction in GHG emissions by 2030 from 1990 levels. 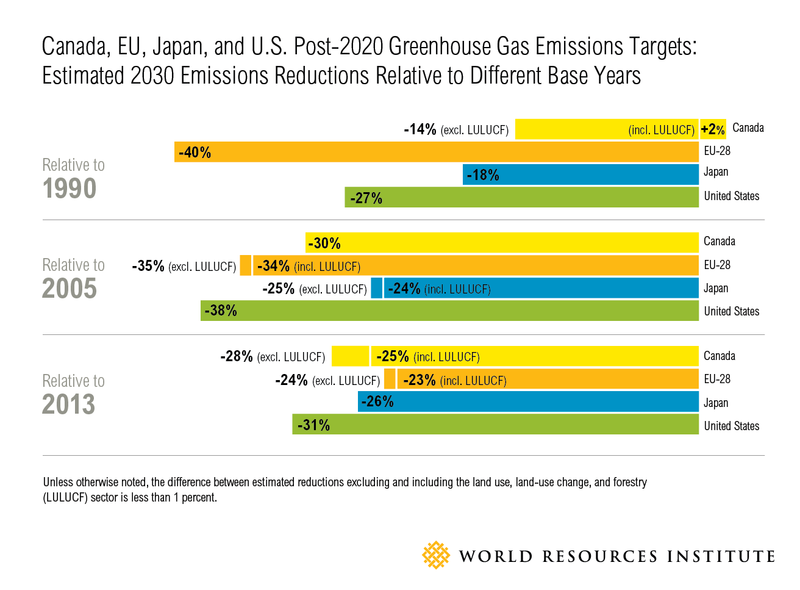 The Japan INDC proposed target is taken as a 26% reduction in GHG emissions by 2030 from 2013 levels. The U.S. INDC target is taken as a 27% reduction in GHG emissions - the median of the range provided in the U.S. INDC - by 2025 from 2005 levels. In addition, United States 2030 emissions levels are then interpolated based on estimated emissions levels for 2025 and 2050. (The U.S. INDC suggests an emissions trajectory that aims to achieve an 80% reduction from 2005 levels by 2050). Historical emissions data (1990-2013) for Canada, Japan, and the United States come from each country’s 2015 national inventory report submitted to the United Nations Framework Convention on Climate Change (UNFCCC) Secretariat. Historical emissions data (1990-2012) for the EU-28 come from the 2014 national inventory report submitted to the UNFCCC Secretariat. An estimate of EU-28 emissions for 2013 was taken from a preliminary inventory report. This figure excluded emissions from the LULUCF. To estimate a 2013 emissions value for the EU, including the LULUCF sector (“net” emissions), the reported contribution of the LULUCF sector for 2012 (from the 2014 inventory report) was added to 2013 emissions value excluding LULUCF. For example, Japan’s target level is calculated using national GHG inventory data totals that exclude the LULUCF sector, while the U.S. INDC considers all sectors, including LULUCF, in the formulation of its target. Japan publishes its emissions estimates according to a fiscal year, rather than a calendar year. https://unfccc.int/national_reports/annex_i_ghg_inventories/national_inventories_submissions/items/8108.php. We will update these with the latest national GHG inventory figures when they become available. As of 2015, national inventories for Annex I countries will be reported using global warming potential values from the IPCC’s 4th Assessment Report. The EU 2014 inventory uses global warming potential values from the IPCC’s 2nd Assessment Report.